Each goalie featured so far has brought something new to the table, and Haelle is no different. 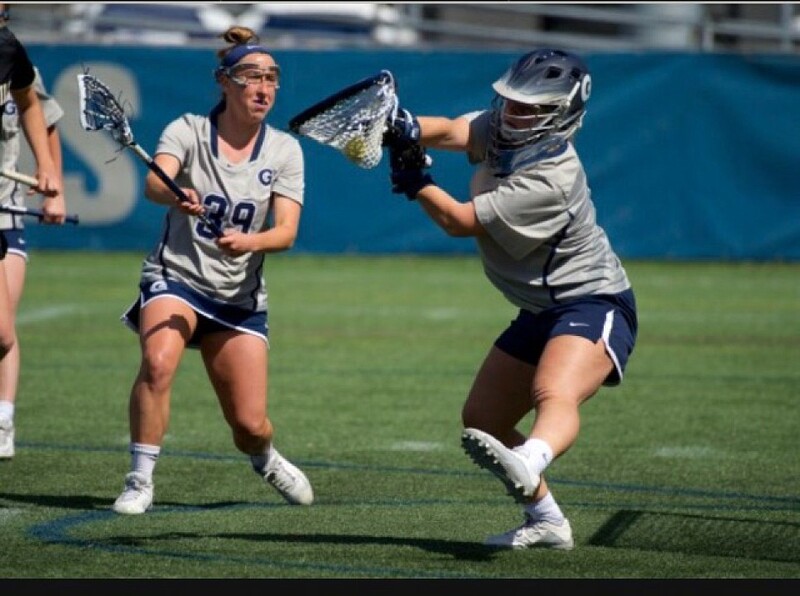 In this goalie spotlight, you'll hear about the challenges she faced and how she got recruited without playing club lacrosse. I'm extra excited to share some of Haelle's story because before she moved to Florida, she attended my alma mater St. Mary's High School (Go Saints!) and I've seen firsthand the work she's put in to get to where she is. I can't wait to see the success that follows in her senior season, and I know you all will enjoy Haelle's words. How long have you been playing goalie/lacrosse? Started lacrosse at age 5 as an attackman (15 years)- switched to goalie in 5thgrade (10 years). What drew you to the position? All the kids started running circles around me (haha just kidding but that is the answer I have told people before). No the real reason was that my middle school league team was down a goalie and I stepped in to fill the position and my father saw potential for me in the cage. He then reached out to local goalie coach prodigy Jack Manley and he said he could work with me and the rest is history. What’s your favorite part about playing the position now? Honestly, knowing that I, in some way, control the game. As a confident individual, I know that my presence in the cage can make or break a team and I take great pride in knowing that I have that control for my team because I believe in myself greatly and I think that’s an important quality to have as a goalie. What’s the hardest part about the position for you? How do you try to manage or handle that aspect? The hardest part of the position for me is the want to make every save and successfully complete every clear. It is extremely difficult to try and manage the anger/frustration of not fulfilling this want to make every save but learning to channel it into different aspects of the game has completely changed my mentality. If the time is available- journaling after practice and capturing your thoughts in the moment is very helpful, but if that is not available then I enjoy yoga or a brief meditation period. Becoming self-aware and knowing what saves “should be saved” vs “good shot/play” will allow lots of the feelings to be relaxed so that you can move on to the next play and stay consistent. In close games how do you stay focused? The focus in close games is driven by the win. I chase the post-game celebration feeling, the joy that comes at the final whistle and the adrenaline rush. However, also knowing that if the game does not end in our favor and you gave everything you had emotionally, physically, and mentally that game than it is out of your control. The sting of the loss does not go away but ultimately focus is driven by the outcome of the game- win or lose. When things start going south in game, like consecutive goals without a save, how do you rebound and stay confident? What about when things aren’t going well defensively as a unit? As a naturally confident individual- it is hard to be knocked down or upset by the defensive units lack of consistency but one thing that has always kept me moving on to the next play and rebound is simply 3 words- I take a deep breath in and exhale right as before the ball gets to the defensive end I yell out to the defense and for myself: “Alright, big stop!” and without fail the defense and myself respond and find the will to turn it all around (usually haha). Attending a prestigious University such as Georgetown that has the rigorous academic and athletic schedule, time management is always tough. However, being someone that can sit down and spend 3-5 hours a day on homework and be done has always put me in the best position possible to be successful always get at least 7 hours of sleep. Freshman year at Georgetown I did not step foot on the field once, was literally the only player on the roster that did not step foot on the field for a game. Then, sophomore year I got time in about 8 games as the backup and always tried my best to make an impact. This year, I started every game and earned Second Team All-Big-East. From Freshman year until now- the playing time has changed yes- however, understanding my role never changed. I will not lie and say that the first two years were not extremely hard because let’s face it, we wouldn’t make it to the collegiate level if we did not want to play every second. However, what made me stick with it every day was knowing that I had a role and I brought something to the team and always helped. Whether you are the one bringing laughter to those having a bad day, the one bringing energy and cheering, the one that holds others accountable to consistently play at a certain standard, or you are just the one that makes the amazing playlists that pump everyone up- you have a role and it is important. A team does not become successful or not successful because of the 12 players on the field, but rather all players on the team and the coaches. Furthermore, senior year of high school I herniated multiple disks in my back and I have never been the same. I now struggle with consistent chronic back pain. I have also been diagnosed with EDS (Ehlors Danlos Syndrome) with causes pains in my joints and causes elasticity in my skin (my biggest fun fact is that I have stretchy skin)! All of this could be excuses for me to stop playing and call it after a good career but every day I choose to stick it out and continue to get better because I am not satisfied with good- next year I want to finish my career as great! What’s the best part about playing in college? Playing on a sports team always allows for a community to be formed amongst a group of individuals, however, playing collegiate lacrosse creates a family. You don’t just play together and go your separate ways. These girls become the people you live with, the people you eat with for every meal, the people you cry with during conditioning, the people you celebrate the big wins with, and the people that day in and day out make the same decision to be a part of the special family created. The friendships made and the growth that I have made as an individual have come from being a collegiate lacrosse player are going to last a lifetime and that is something that cannot be made up or fake- it’s all real and special. If you committed early, how did you stay motivated to keep getting better? How do you stay motivated now, especially in the off season? I committed late for my grade (October Junior year). The biggest motivation for me is knowing that my lack of work not only hurts my opportunity to play, but it also is going to hurt the success of my team. I would be letting down my teammates to not work in the offseason and I pride myself on knowing that our position is vital to the success of everyone else around us. If you had to do the recruiting process over again, is there anything you would do differently? Not in your choice of school, but things you considered highly then but might not necessarily now? What were the things that were most important to you to look for in a school during your process? I always wanted to go to a school that had the rigorous mixture of academics and athletics. Considering the location of the school is extremely important and understanding the type of person you are in that regard is make or break. Personally, I have never lived in a big busy city with my family but I absolutely love being in DC and the freedom that comes with it. Something I wish that I considered more is a bigger athletic school. I am a person that loves watching sports almost more than anything in this world and sometimes I feel that in my college experience I am missing out on those sports experiences that could be had at a bigger school. Did you feel burnt out after the recruiting process? Have you ever felt burnt out throughout your career? How did you get through those periods? I never experienced feeling burnt out after the recruiting process just because it was not very time consuming for me. However, throughout my career, there have been small spurts of feeling burnt out. Mine mostly comes from times where I am so bruised up from getting hit that every step hurts when I walk or the times where I feel that my life revolves around watching this little yellow ball and this little yellow ball is having my shoulders crushed in pressure, but always the love of the game and everything I have discussed about my teammates always pulls me out of the burnt out feelings. Do you have a favorite drill or one that has helped you the most in goal, with and without someone else? Personally, I absolutely love juggling. I am able to clear my own mind while also focusing and dialing in for whatever I am about to do next. It is time for me to take time and meditate while also working on my skills. Where do you think you have grown the most in your game from high school to college and how did you do it? Did you have an individual goalie coach to help? My game has mostly grown in the mental aspect. I have always been decent at being able to save the ball but for some time my mental stability in the cage set me back. I became a perfectionist and projected my anger outward. Today, I am able to hold in outbursts and understand when I shouldn’t save the ball. My collegiate head coach consistently reminds me to keep my emotions under control. I don’t have a specific way to magically make it better and controlled but every day it takes consistent effort to channel the emotions and understand better what is in my control and what is not. Something you could tell yourself now when you were first learning the position? You do not have to be perfect. I wish from a younger age I was able to decipher what I should save and what I shouldn’t. I am someone that listens to music very loudly and dances around. I am a very hype person- it helps me channel my confident attitude and it also helps my teammates get pumped up around me. I mentioned my stretchy skin in the earlier question and that’s usually my go-to fun fact. Anything else you think young goalies would find helpful or interested in knowing? As someone who had played club lacrosse since 5th grade and strongly believed it was the only way I would get recruited I want you to know that it doesn’t have to be that way. Club turned into a very offensive based tool and I am sure that the new recruiting rules are going to change the culture around the recruiting process drastically, but I stopped playing club lacrosse before my Sophomore summer (the pivotal summer for being recruited back in the day). Instead, I chose to attend the camps and clinics at colleges that I wanted to attend. It was stressful and I spent many nights lying awake crying and cursing the heavens questioning the decision my family made to do it our own way. However, if you believe in yourself enough and truly have the will to play at the next level- there will be a place for you out there! For all the stress that was caused, it was all worth it in the end because I ended up at the perfect place for me that incorporated everything I could have ever dreamed of.